Berlin and its Visitors Who Does The City Belong To? 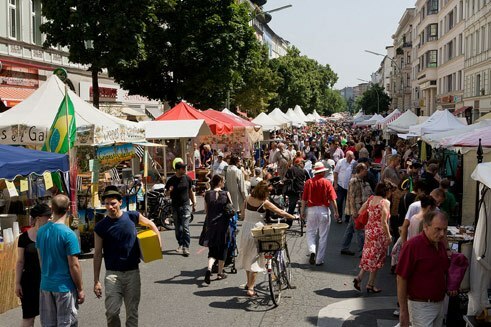 Berlin enjoys a splendid international image and is becoming more and more popular as a tourist destination. Its residents, however, feel they are being blindsided by this onslaught of tourists and complain that their city is being sold down the river. What is urgently needed are a few intelligent urban planning strategies, but the politicians have a hard time dealing with this. Berlin has a problem with its tourists. The residents of certain districts are at the end of their tether and complain about all the excessive partying going on in their vicinity. Whole streets, others say, are geared more and more to accommodating the needs of the visitors. Blocks of rental flats, they say, have effectively turned into hostels, because more and more flats are being transformed into holiday apartments – and often illegally. Recently an “etiquette brochure” for visitors was published, but it seemed to have an air of desperation about it: Dear party–tourists, please do not pee in our doorway! Dear stag night and hen–party revellers, please try not to shout quite so loud after 10 p.m. The discussion, however, is not actually that new. For quite a few years now slogans like “Tourists Go Home!” have been doing the rounds in certain districts, the hordes of visitors have been stylised into a kind of “Eleventh Plague”. Activists have called, in all seriousness, for a “downgrading” of certain neighbourhoods to make them unattractive to the annoying visitors. It has also been a well–known fact for quite some time that this so–called tourist bashing is under the surface actually quite xenophobic. The tourist, the foreigner, the temporary migrant, who poses a threat to people’s habitat just by being different. In the meantime, however, this attitude is in turn being combated by other activists who are demanding an “upgrading” of the neighbourhoods to counteract this hatred of tourists. “There is a real clash of cultures going on in Berlin”, says Andreas Becker, putting the debate into a nutshell – a debate that in the meantime has become somewhat abstruse. For 15 years he has been the managing director of Circus – one of the city’s most popular hostels on Rosenthaler Platz. Becker has a problem with all the excessive partying going on in the in–districts and feels that the image of German booze–fuelled debauchery on the banks of Berlin’s river Spree, as is the case at Ballermann 6 beach in Majorca, would be a disaster for the entire sector. When all is said and done, however, it is not tourism that is to blame, but more the way the city of Berlin channels the flow of tourists. This also means, however, that Berlin, just like any other city confronted with the phenomenon of mass tourism, will have to define rules; to promote a discussion on how a metropolis should define its own identity. It is, however, this process in particular that does not seem to be getting off the ground in Berlin. The question is why? There are psychological reasons for this according to Andreas Becker. “Berlin is a city that prides itself in being more liberal than other cities. Breaking rules is to a certain extent a part of the way it defines its identity.” How else, he continued, can it be explained that a city which quite definitely has instruments at its disposal to regulate party tourism does not use them? “If we had started years ago, it would have been the easiest thing in the world to curb the drinking tours and pub crawls that in the meantime have become so notorious”, says Becker. According to regulatory law it is not allowed to sell alcohol to people who are drunk. It is of course questionable what people understand by the word “normal” when they are discussing the condition towards which Berlin is developing at the moment. Is this increasing metamorphosis of inner cities into consumer zones “normal”? Or might it, on the other hand, actually be much more “normal” to expect a modern metropolis like Berlin to adopt a different approach to tourism other than a mere means of maximising of profits? “Berlin has to overcome its fear of planning its own future and ask itself the question – who does the city belong to?”, says Andreas Becker.